Live-cell imaging applications require stable, long-term, high-resolution imaging that is unaffected by changes in temperature and optical aberrations. However, the use of standard immersion objectives in live-cell imaging can introduce issues with spherical aberration caused by refractive index mismatch. The refractive index of living cells is 1.38, whereas the refractive index of water immersion objectives is 1.33 and 1.52 for oil objectives. This difference in comparison to living cells introduces spherical aberrations and means that light rays are unable to come to a single focal point in the Z plane, causing blurring and spatial distortions in 3D reconstructions. Silicone immersion objectives on the other hand have a refractive index of 1.4 – much closer to that of living cells – reducing spherical aberration to a minimum. This results in brighter and higher-resolution 3D images of living cells and tissues without spatial distortions, particularly at deeper sample depths. In addition, silicone immersion objectives are resistant to temperature and humidity changes, with virtually no evaporation at 37°C – the temperature of incubation chambers. These properties are aiding researchers in live-cell imaging experiments across a wide range of applications – and even helping to drive technological advances. Thanks to the advantages discussed, silicone immersion objectives are proving vital across a wealth of live-cell imaging applications. These include the macro and micro observation of embryos, zebrafish and other model organisms in developmental biology; and in regenerative biology for the development and differentiation of embryonic stem and induced pluripotent stem (iPS) cells. The ability to obtain high-resolution imaging of brain slices and neural cultures makes them well suited to neurobiology. Silicone immersion objectives are also ideal for certain superresolution applications due to their ability to produce an excellent point spread function at greater depths, where they easily outperform oil immersion objectives. They are also more effective than water immersion objectives as they have a larger NA for comparable magnifications, reduced refractive index mismatch (Fig.1) and less evaporation. 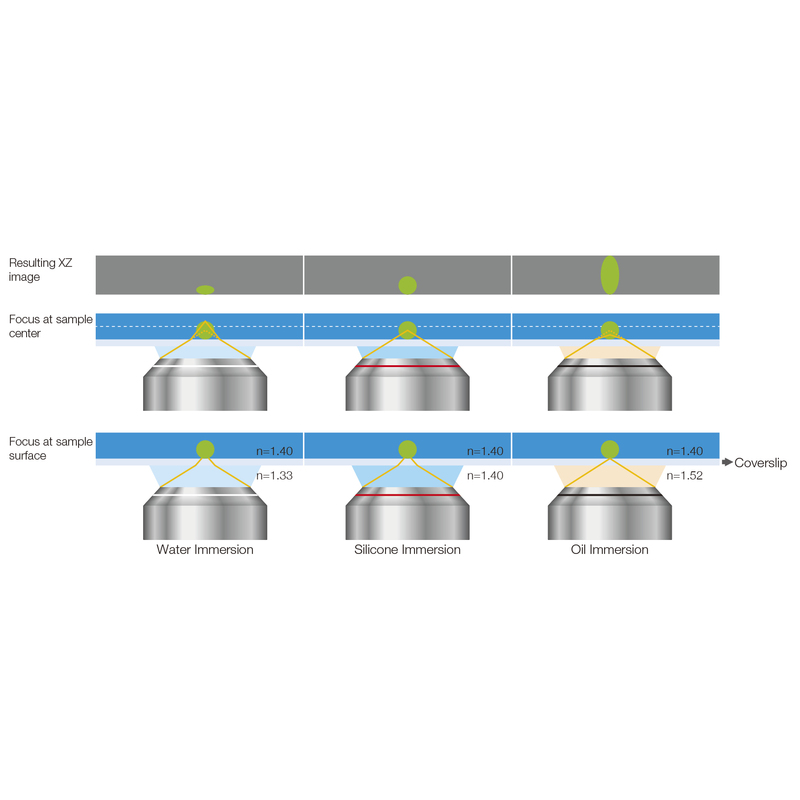 In addition, certain silicone objectives are ideal for multiphoton imaging. These objectives typically have special coatings with high transmission up to 1,600nm wavelengths. Silicone objectives also have a similar refractive index to some clearing agents such as Olympus Scaleview-A2 (1.38), meaning they can be used in advanced clearing techniques to produce less light scatter for better resolution and deeper imaging. Highlighting the advantages of silicone immersion objectives over traditional oil, researchers at the Department of Anatomy at Japan’s Hokkaido University Graduate School of Medicine compared images of mouse brain sections taken with 60x oil and 60x silicone immersion objectives. Bright fluorescence images were obtained with both sets of objectives, however X-Y images taken with silicone immersion objectives at a depth of 35μm were brighter with higher resolution (Fig.2). The reduced refractive index mismatch of the silicone immersion objective enabled excellent performance in deep tissue observation on specimens rendered transparent. Silicone immersion objectives are also proving vital in deep, high-contrast 3D live-cell time-lapse experiments. This is due to their reduced spherical aberrations, superior performance in maintaining focus for long periods of time, and resistance to changes in temperature. In a study at the Department of Genetic Engineering at Japan’s Kindai University, silicone objectives enabled sharp 3D fluorescence images of proteins, DNA and other molecules in the zygote and individual cells during embryonic development. A 60x silicone immersion objective was used for 3D time-lapse imaging over four days during in vitro development of a mouse embryo from zygote to blastocyst. The team had been using an oil lens and water immersion objective, the previous standard for deep observation. Only by switching to a silicone immersion objective were the researchers able to view fluorescently labelled methylated DNA (mCherry-MBD-NLS) within the nuclei from the surface to the inner region – from the one cell zygote to the blastocyst stage (Fig.3). Designed to have lower chromatic aberration, silicone objections are ideal for use with multiple fluorescent labels especially in colocalisation experiments. In a study at the RIKEN Brain Science Institute Laboratory for Cell Function Dynamics, researchers used a silicone immersion objective with an inverted confocal laser-scanning microscope to make high-resolution deep tissue observations of morphologically intact cells within a whole mouse placenta without needing to section it. It was possible to precisely observe colocalisation of ubiquitination-based cell cycle indicators (Fucci), (S/G2/M-Green, G1-Red) and the nucleus (DAPI-Blue) (Figs 4 and 5). Silicone objectives are even driving new technologies in live-cell imaging. The world’s first long-term, real-time observation of plant zygote embryogenesis was made possible by combining a new ovule culture system with a microscope capable of high sensitivity embryo imaging inside the ovule and covered by multiple layers of cells. In this study by The Optical Technology Group of ERATO Higashiyama Live-Holonics Project at Japan’s Nagoya University, long-term live-cell imaging of plant zygote division and growth was made possible by the development of a special medium and a new microdevice, the use of which included a silicone immersion objective (Olympus UPLSAPO30XS) (Fig.6). This objective has a high numerical aperture of 1.05 and a long working distance of 0.8mm, which is required for deep, high-definition imaging while retaining a wide field of view. With this set-up the process of embryogenesis was stably observed in real time for 67 hours from the early to late embryo. As shown by the examples discussed here, silicone immersion objectives are proving to be the perfect partner for live-cell imaging applications, delivering unmatched resolution, clarity and reproducibility.